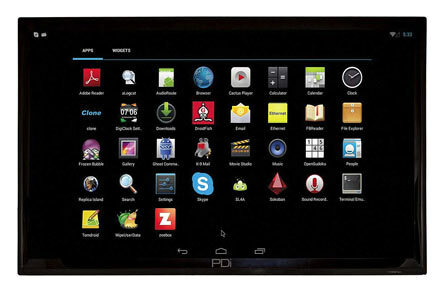 Android Module Solutions | PDi Communication Systems, Inc. Expand entertainment and increase patient engagement by seamlessly adding an Android OS to E-Series healthcare displays. Patients can stream movies, videos, music, surf the Web and access hospital communications, patient education, and other other interactive features through Android’s open-source system. You always have the ability to customize and update the patient interface and download apps through the remote device management software, PDi-PORTAL and PDi-STORE. Configure to fit your needs! Quickly attach an open-source Android Module to your PDi E-Series set and connect the control method you’d like. PDi provides a hospital-grade wireless keyboard or your preferred pillow speaker.